An idiosyncratic and ambitious novel from the author of The Spoiler (2012). 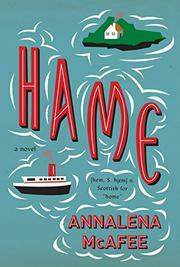 “Hame” is Scots for “home.” This is a novel shot through with Scots poetry (invented by the author), interwoven with passages from the diary of a Scots poet (invented by the author), broken up by excerpts from a scholarly work on said poet (invented by the author, obviously), and studded with footnotes (referencing works invented by the author). There’s a glossary here and a bibliography. There are recipes. All of this is to say that, while the words “a novel” on a book cover can usually be read as a simple description, that phrase, in this case, is instead a rather provocative assertion. Certainly, McAfee is not the first novelist to use invented texts and scholarly apparatuses in service to contemporary fiction. Possession by A.S. Byatt is an obvious comparison. Susanna Clarke’s Jonathan Strange & Mr. Norrell and the fiction of Umberto Eco also come to mind. But Eco combines erudition with a healthy appreciation of juicy Gothic tropes. Clarke has magic. And there’s a fateful connection between the figures Byatt invents and the scholars who study them. What McAfee presents here will, perhaps, be most familiar to readers of J.R.R. Tolkien—who gives readers orcs and elves, sure, but in service to exhaustive worldbuilding. The island of Fascaray is Scotland in miniature in both landscape and history. Mary, Queen of Scots; Bonnie Prince Charlie; and Charles Rennie Mackintosh have all visited this remote place. And Grigor McWatt spent his life cataloging the place in both prose and poetry. McAfee's protagonist, Mhairi McPhail, moves from Manhattan to an island in the Hebrides because she’s writing a book about the “Bard of Fascaray” and because her marriage is over. The verse is convincing enough, and Mhairi’s study of McWatt certainly reads like an academic text. But ask an academic: how many people read their books? The sections presented from Mhairi’s point of view are more accessible, but the snarky tone is a bad fit here. While it’s easy to envision diverse readers attracted to this book, it’s difficult to imagine any reader who isn’t skimming over vast swathes of the very, very, very long text. Impressive worldbuilding, but to what end?